picturesque areas of Puglia. A gem we recommend wholeheartedly to couples and incurable romantics. 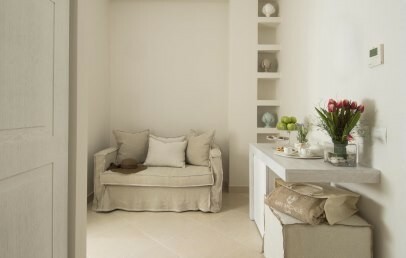 Set in the historic centre of Polignano a Mare, San Michele Suites looks out over the sea from the heights of the coastal cliff dominating Lama Monachile, in one of Puglia’s most picturesque settings. The hamlet of Polignano is just perfect for lovers of walks and strolls, but just a few km by car will take you to the other attractions of the region, such as Monopoli (9 km), Alberobello (24 km) and Bari (33 km). 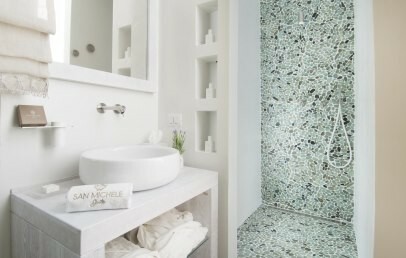 San Michele Suites is a beautiful residence which offers guests 5 luxury suites and an exceptional terrace overlooking the sea, kissed by the Puglia sun. Furnished with chaises longues, chairs and tables, the terrace acts as a pleasant solarium for taking breakfast or quite simply relaxing. 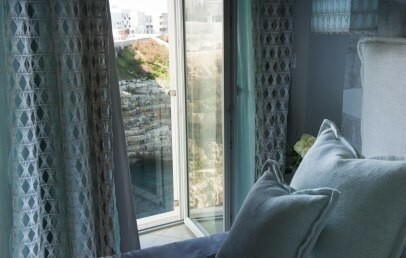 The residence consists of 5 suites, 3 with sea view and 2 looking over the hamlet; welcoming accommodations built directly into the rock and marked by their minimal, refined style. 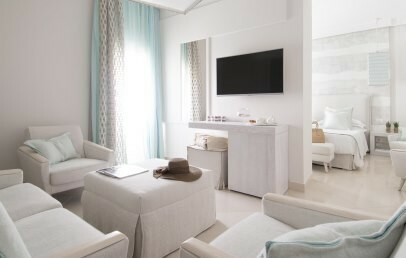 All suites consist of two areas – sleeping and living, and have a full range of comforts: Wi-Fi connection, flat-screen TV with satellite channels and pay per view, AC, safe, mini-bar, phone, alarm clock or phone wake-up. 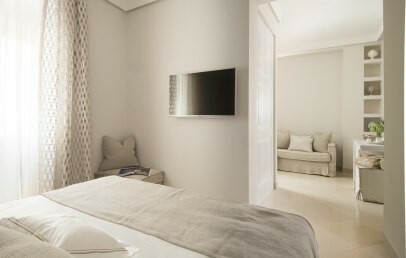 Each room has an en-suite bath with shower, bathrobes, slippers, hairdryer and set of courtesy toiletries. Cost of your stay includes breakfast, Wi-Fi connection in all suites, bicycle rental and rickshaw transport service from the vehicle parking area to the hotel and back. A private covered garage is available in the vicinity and costs € 20.00 per day. The international buffet breakfast is served on the terrace from 8:30 to 10:30. In the winter months, breakfast is served in your room. We suggest that you inform reception of any special food needs. Reception is open from 8:00 to midnight. Check-in from 15:00 and check-out until 11:00. Late check-out is possible up to 13:00 with payment of a supplement of € 40.00. Please indicate departure requirements to reception in advance. 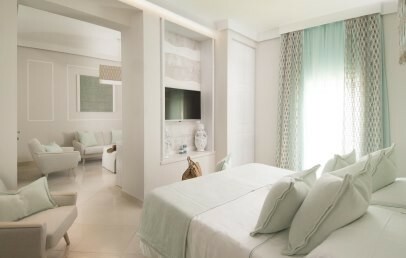 Exceptional accommodation set sheer over the sea, these suites are marked by their minimalist elegance and the extensive use of white. They consist of a night time zone and a living area and have a full range of comforts. The en-suite has a shower, bathrobes, slippers, hairdryer and courtesy toiletries. These suites face onto the alleys of the historic centre, giving occupants a privileged view into the intimate life of the town. Rooms consist of a nighttime area and a living area and are marked by their relaxing ambience, with simple modern furnishings and use of white. 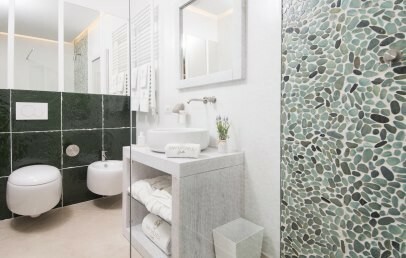 The en-suite bathroom has a shower, bathrobes, slippers, hair dryer and set of courtesy toiletries.